Saving for retirement is among the most important financial actions you’ll ever take. While you should start saving for retirement as soon as possible, don’t fall into the trap of thinking that it’s too late to make a difference. Regardless of when you actually start saving, you can make a difference in your bottom line and establish a healthy retirement savings for your golden years. The first thing you’ll need to do is decide in what type of retirement account you’d like to place your savings. There are several choices available, each with its own positives and negatives. Most people know that there are various retirement account options, each with it’s own set of rules and requirements. Discover which account makes the most sense for your individual situation and needs by reading the information below. A 401k is a common employer-sponsored type of retirement account created in 1978. This is a tax-deferred investment account, meaning taxes aren’t paid until the money is withdrawn and contributions are pulled from pre-tax income. 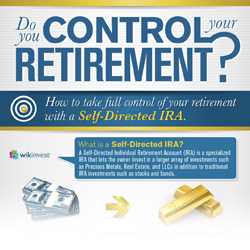 An Individual Retirement Account, or IRA, is a popular choice for individuals who don’t have access to a 401k (such as the self-employed). Earnings with an IRA account have no tax impact until withdrawal of funds. The most versatile type of retirement savings, and the only type American Bullion helps you set up is the self-directed IRA. 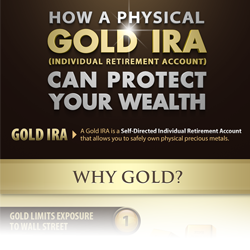 With a self-directed IRA, you can back your retirement savings with the security of physical gold, precious metals and other alternative investments that are not accessible through other types of retirement accounts. The biggest question retirement experts receive from their customers is amount of money individuals need for retirement. The exact number depends on a variety of factors, including your income & investments, geographic location, lifestyle, age at retirement, and more. Who should be the beneficiary of my retirement account? While it may seem like a simple matter, there are actually a number of factors to consider when naming your retirement account beneficiary. Considerations include the effects on taxes and distribution, options like trust funds, and charities, and implications of splitting benefits across multiple groups or individuals — read this article to learn more. Why should retirement be my number one financial goal? While it is important to set achievable micro-goals along the way, experts say there is no overall financial goal more important than establishing a healthy retirement savings. Securing a comfortable retirement can take longer than most people think, and can be impacted by health complications and other life changes. Read this article to find out more. What are some last-minute retirement savings tips? As individuals approach retirement age, some begin to panic due to the fact that they haven’t started saving enough for retirement. Options like increasing or supplementing your income, and/or upping your level of acceptable investment risk are just two last-minute retirement savings tips to consider. There are a number of ways to max out your savings, even if you’re getting a late start.